Why? Because my son, in his infinite wisdom, didn’t want to go out on a limb and call me the best mom in a text he sent me to wish me a happy Mother’s Day. No doubt, he was afraid I might get an inflated ego over it. Of course, little did he know, telling me I was “probably” the best mom was enough to drive me crazy and I set out to discover what exactly he meant. I first wrote the post when I started blogging, but it’s perfect for Mother’s Day, so, please read it–and comment! 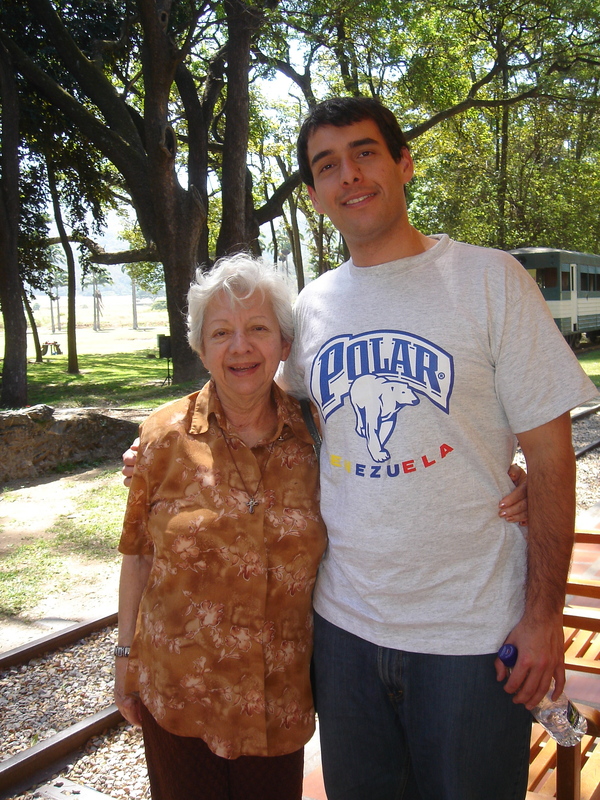 My son, during a trip to Venezuela, with Tia Olga, who passed away earlier this year. Item 2: This time of year, it’s easy for me to get all teary-eyed and start waxing poetic. This is because I lost my mother 18 years ago this month. Plus, I’m a romantic at heart and, as such, I’m prone to getting sentimental at the drop of a hat. 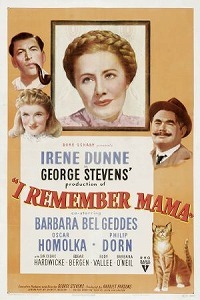 For years, my mother and I had a Mother’s Day tradition of watching I Remember Mama, one of our favorite films. (FYI: Turner Classic Movies usually carries it around this time.) It’s sappy as all heck but don’t you dare make fun of it because to me, it’s such a tear jerker. If you’ve seen it, you know what I’m talking about. It’s got everything–pathos, humor, suffering, a cat that dies then comes back to life, a crazy uncle who yells a lot, and a mysterious boarder who’s into reading. Add to that, a hard-working, ready-to-sacrifice-all-for-her-family kind of mother. It’s classic! “For as long as I could remember, the small cottage on Castro Street had been home. The familiar background was there; Mama, Papa, my only brother, Nels. There was my sister Christine, closest to me in age, yet ever secret and withdrawn — and the littlest sister, Dagmar. “There, too came the Aunts, Mama’s four sisters. Aunt Jenny, who was the oldest and the bossiest; Aunt Sigrid; Aunt Marta; and our maiden Aunt, Trina. The Aunts’ old bachelor uncle, my Great-uncle Chris — the ‘black Norwegian’ — came with his great impatience, his shouting and stamping. And brought mystery and excitement to our humdrum days. 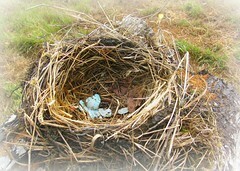 Item 3: My mother had five sisters and one brother. Now, only one sister, Tia Livia, remains. Tia Olga, the second to youngest, died earlier this year. She was kind and gentle and deeply spiritual. She was the only one who never married nor had children. In her final years, living in Venezuela with no income of her own, it was the nieces and nephews who took care of her, making sure she had all she needed. I sent her what I could, including chocolates from the states and the latest issues of Reader’s Digest, one of her favorite magazines that she enjoyed reading in English. I loved her so much and miss her dearly. Reading that made me fall over in a heap of giggles. What was coming from Jersey? Sounded dangerous and wicked! Well, you’ll have to read Deborah’s blog to find out more. Deborah has also written a collection of essays titled, Because My Name is Mother. Laced with humor, tenderness, and a bit of nostalgia, you’ll find these stories quite enjoyable, and, best of all, they’re now available for Kindle for only $0.99! A bargain, if you ask me, and makes for a great Mother’s Day gift for just about anyone! But, Readers, I’ll let you decide. Read my story in the Huffington Post, and then be sure to let me know what you think! Now, how about you? What do your kids do to show you their love? That’s me, the Cartographer’s Daughter. That’s what I’ve decided I’m going to call myself. It sounds much better and more exotic than introducing myself by just saying my name. Boring. That’s so yesterday and I, after all, like to follow a trend. You know which trend I mean. 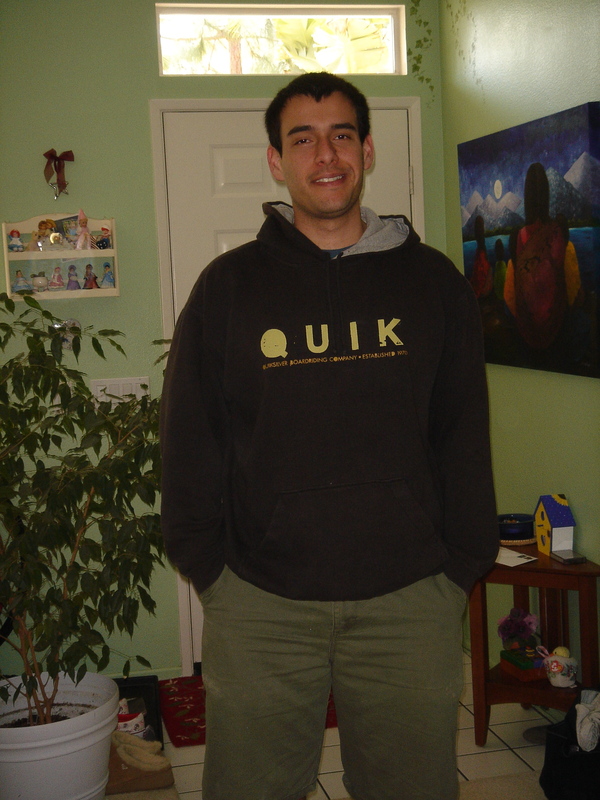 The one in the book publishing business. This is my favorite novel in this book title genre. 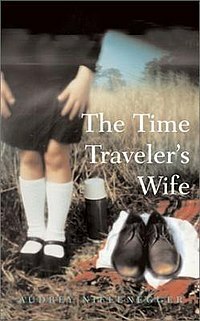 Written by Audrey Niffenegger, it is her debut novel. These are all actual book titles and from the title, I’m never certain who the book is about—the zookeeper or the wife? The time traveler or his wife? The hummingbird or it’s daughter? Or both? And what exactly is a memory keeper? I know what a hangman is. Never met one, but I have a good idea of what he does for a living. But half the time, I’m baffled by these cryptic titles. And why are there so many books following this fad, anyway? Have publishers discovered that books with such titles fly off the shelves and sell faster? Here’s another mystery: Why are there so many books about the daughter yet hardly any about the son? What is he, chopped liver? In fact, in a search on Amazon.com, the only book that came close was one titled, “The Poacher’s Son.” If you ask me, I’d be more interested in learning about the poacher than the son, whose only claim to fame is that his dad was a poacher. Or maybe it was his mother that was the poacher. Kind of like that classic riddle about an injured boy and his dad, who were both rushed to the hospital and the doctor, upon seeing the boy, said, “I can’t operate on him. That child is my son!” Turns out the doctor was the boy’s mother. So maybe the poacher is too. Well, I’m the Cartographer’s Daughter because that’s what my father was when he was young and dashing, and still lived in Venezuela. He’d fly over the Amazon Jungle in small propeller planes, taking photos of the landscape, which were then used to make maps. How exciting and thrilling that must have been! Wish I’d known him then. I could have joined him on one of his many adventures. Sigh. Anyway, I’d rather be known as The Cartographer’s Daughter than by the title of the job he got after he graduated from New York University. Somehow, The Life Insurance Agent’s Daughter doesn’t sound quite the same. And I’m not alone in this judgment. Notice you don’t see any books titled, The Dental Hygienist’s Daughter or The Trash Collector’s Wife. Not exotic enough, if you ask me. So now that I have my new title, guess I’ll have to write my memoir to go with it. And even if I end up writing the worst book ever, with a title like this one I can’t go wrong. The Cartographer’s Daughter is going to sell like hotcakes. And that you can take to the bank or, better yet, to The Banker’s Daughter. Football season is here! I’m so excited that I’m beside myself! It’s time to get out all my San Diego Chargers gear—my a-bit-on-the-snug-side Charger tees, my Charger sweatshirt and my Charger baseball cap. My Charger banner too. I’m a big Chargers fan, you know. 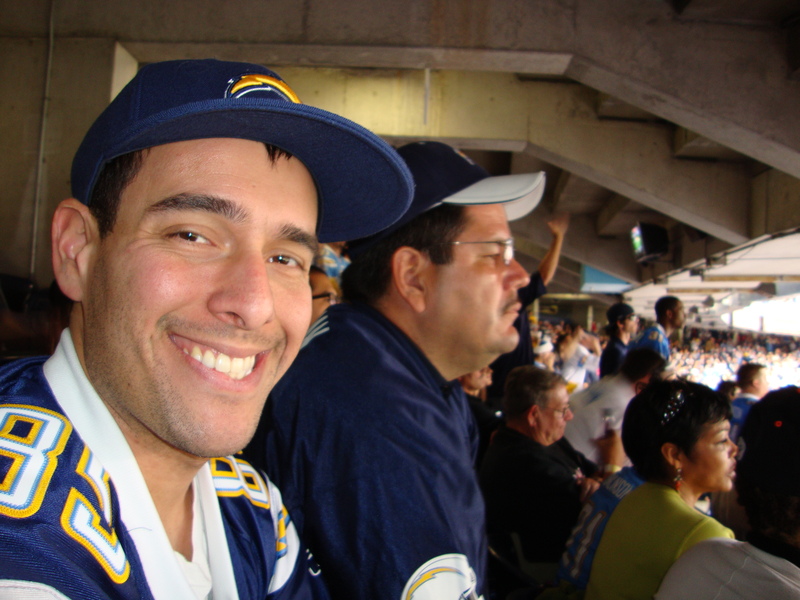 At least that is the case since I figured out that my son Josh, really, really is a BIG Charger fan. He’s a mega-obsessed fan who knows every member of the team (I’m lucky if I can name one), where they attended school, their statistics, their injuries and what their odds are for playing well this season. And he’s been so patient trying to teach me everything about the Chargers and the game, so I can be a true blue fan too. I listen and nod and I try to take it all in. Emphasis on try, but the thing of it is (and please don’t tell him), I just don’t get it. Guys running across the field and then they run back, throwing the ball a few times and man, can they throw far! Of course, the other team makes it so hard for them to run across, constantly tackling and flinging themselves unmercifully on their opponents. Why can’t they just take turns? Why do they have to play so rough? It’s no wonder they have to wear all that heavy equipment, if you ask me. How their mothers can stand it, I haven’t a clue. So obviously I don’t know much about the game. But that doesn’t matter. The real reason I’m so excited that football season is here is because it means my son is bound to come down to San Diego and visit me! Josh will want to go to a game or two and he will want to stay over because it’s too much trouble to make a round trip drive back to Ventura in one day. So I can’t wait. I’m going to pour over the home game schedule. Then I’ll call him and nonchalantly ask which games he’s planning to attend this season. I’ll make sure I’m free on those weekends so I can be available for quality time. I’ll act as if I know a thing or two about the Chargers, and ask him what he thinks about the new roster. I’ll offer up a word or two about this year’s defense. Maybe I’ll drop a few statistics that I’ve just researched extensively online, so that he’ll be so impressed he’ll want me to come along again. Thanks to a friend at work, Josh and I scored tickets for a game against the Cincinnati Bengals last December. Another win for the Chargers! Last fall, Josh’s boss gave him a pair of tickets to see the Chargers play the Miami Dolphins and Josh invited me to join him! It was right around my birthday so I figured it was his gift to me, which made it truly special. What better gift could a mother desire than to go to a game with her son? A chance to spend some extended quality time with my son, all decked out in our Chargers team best, watching him get all worked up over a football game! His favorite team in the world playing the Dolphins! Problem is, I just adore dolphins. I have been to Sea World many times and I find the dolphin show to be amazing; they’re so clever and smart. Which made me feel sort of bad about rooting against the Miami Dolphins, particularly since they wear such bright and cheerful colors—turquoise and orange—reminiscent of Don Johnson and Philip Michael Thomas on the “Miami Vice” show. Why do we have to pick sides, anyway? Can’t they all be winners? 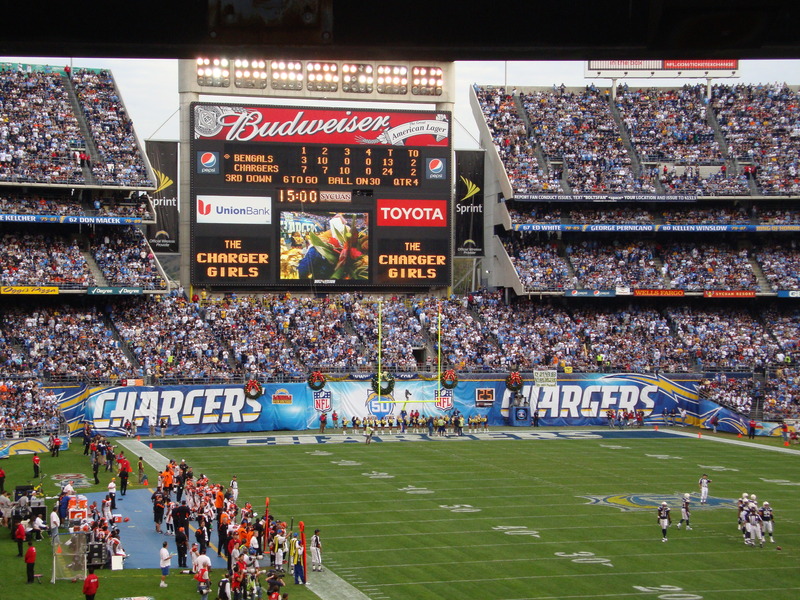 Still, for my son, I overcame my fashion sensibility and firmly planted myself in the Chargers’ corner, which meant cheering for every Charger field goal, groaning each time the Dolphins scored and doing a happy dance when the Chargers finally won the game. Yes, it’s football season and I’m changing the sheets on the guest bed which actually used to be Josh’s bed. And I’m baking my special recipe for banana bread, his favorite. I’m also stocking up on laundry detergent so I can get ready to wash the stacks of dirty clothes that he’s sure to bring with him. It’s football season and I just can’t wait. Go Chargers!